This is where we create the main part of the response - the response body. The payload can be pretty much any text format, with a natural preference for XML and JSON. A binary response payload is hard to create at the moment - sorry. 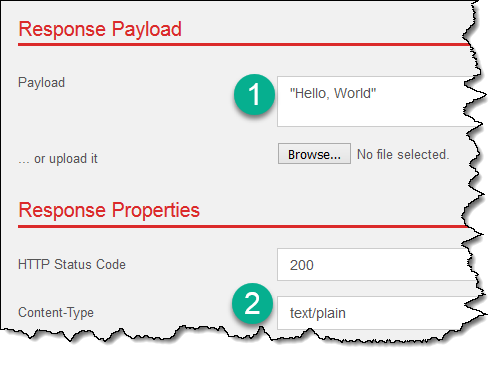 The payload Content-Type header is defined in the Response Properties section and it should match the generated response. XML payload is used for SOAP and XML services. Some content types that have XML as their base format, e.g. HTTP GET for WSDL, will also use XML payload. If the response is quite large, you can also upload it using the input field under the response text area. Dynamic payload is generated using XQuery. The response XQuery has several variables available, including the request and its properties, mock accounts and meta information. See more about variables here. The response payload can generally be of any text format but the most commonly used is JSON. The Content-Type of the response is defined in the Response Properties section and this controls how the payload will be interpreted by the client. Note that in this case the content type should most likely be defined as application/json.